WHAT: Eliza Doolittle (Academy Award® winner Audrey Hepburn, Breakfast at Tiffany’s) and Professor Henry Higgins (Academy Award winner Rex Harrison) match wits while singing and dancing their way through one of the most visually magnificent and transcendent musicals of all time in My Fair Lady. Remastered for the ultimate visual and audio experience, the hit musical will return to movie theaters nationwide for two days only on February 17 and 20, 2019, accompanied by pre- and post-film insights by TCM Primetime Host Ben Mankiewicz. Fans can also be enchanted by the My Fair Lady high-definition Blu-ray™ with must-have special features, including audio commentary, featurettes, vintage footage, galleries and more, available now from CBS Home Entertainment and Paramount Home Media Distribution. WHERE: Tickets for My Fair Lady can be purchased at www.FathomEvents.com or participating theater box offices. Fans throughout the U.S. will be able to enjoy the event in hundreds of select movie theaters through Fathom’s Digital Broadcast Network (DBN). For a complete list of theater locations visit the Fathom Events website (participating theaters are subject to change). 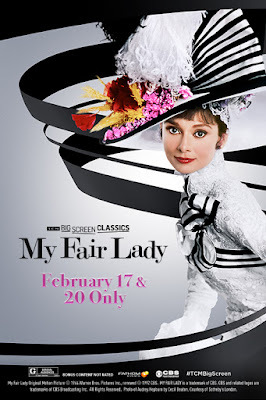 My Fair Lady Original Motion Picture © 1964 Warner Bros. Pictures Inc., renewed © 1992 CBS. MY FAIR LADY is a trademark of CBS. CBS and related logos are trademarks of CBS Broadcasting Inc. All Rights Reserved. Photo of Audrey Hepburn by Cecil Beaton, Courtesy of Sotheby’s London.